I’ve been using Google Chrome for some time already, and it became my default browser. I think it is pretty cool. It is very fast. I have also found out some unique features that Google Chrome has, the feature which no other browsers have. Here is the list of Google Chrome’s unique features, the features that Mozilla Firefox and Internet Explorer don’t have. When the site is being resolved, Chrome will display this gray line, revolving slowly, counter-clockwise. When the site is found and is being loaded, Chrome will show this blue line, revolving quickly, clockwise. Wow! 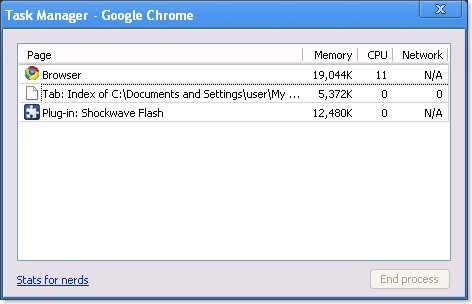 A task manager inside a browser. It is just like a normal task manager, showing the processes and the memory it uses. 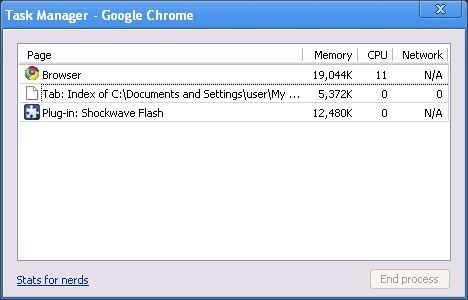 If your computer seems as though it is going to crash, you can open the Google Chrome task manager and see which tabs are using a lot of memory, and then end their processes so your computer won’t crash. Don’t worry. The tab won’t be closed, but instead show a crashed smiley. If you reload that tab, the process will begin again. If you end a process such as shockwave flash, the flash object will show the crashed plugin smiley. 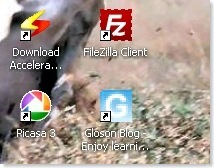 To open the task manager, hit ‘Shift + Esc’. Reload the page to refresh the stats. I do not exactly know how the stats work, but this is a feature of Google Chrome that no other browsers have. Without a doubt, this is stats for nerds. Google Chrome also can create application shortcuts, like this. If you click on that icon, a Chrome window will appear, displaying the website. 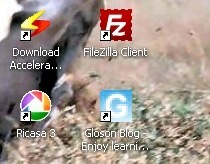 Application shortcuts can be created at the start menu, the quick launch bar, and the desktop. To create application shortcuts, follow these steps. Unlike IE and Firefox, Chrome displays find (Ctrl + F) results at the scroll trough. 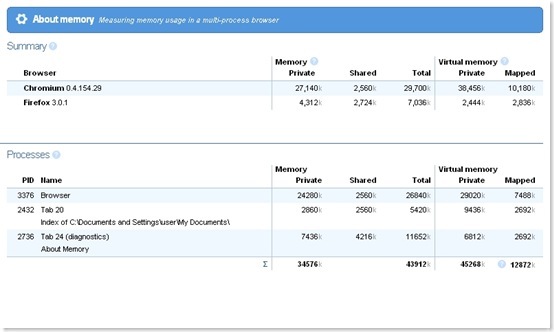 It also highlights other find results (which is also featured in IE 8). I find this feature convenient, especially when I am designing my blog – I view the source of a page, then I use the find feature (Ctrl + F). It also adds to my HTML knowledge. Oh, yes. Open Chrome, Firefox, and IE at once and Chrome will pop in front of your eyes before the others do. I wonder how Chrome can open so quickly. You don’t have to type the full web address of a site you’ve visited. Chrome will suggest it for you. You just have to press ‘Enter’ to visit the site. 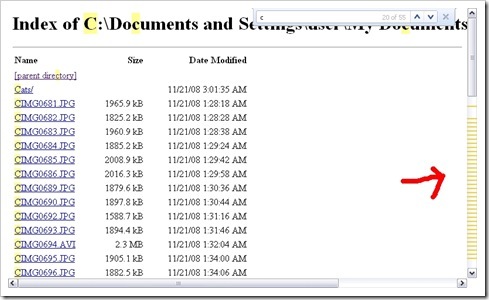 This is useful for long site addresses. Also, if you type a term, such as ‘Internet Explorer’, Chrome would list out the popular sites that are related to it. For example, Chrome would list IE’s homepage if you type ‘Internet Explorer’. To know more about this, watch this video. If you typed in the address bar a searchable site or a site with a search engine, Chrome will notify you to press tab in your keyboard. After you pressed tab, type the search term, and then hit ‘Enter’. The search results will appear in no time. See picture above. Each tab has its own process (which is why you see many chrome.exe’s in the ‘Processes’ tab of the task manager). So, if a tab crashes, the other tabs won’t crash. This is useful if you are in a middle of something such as writing an email or any unsaved work. If any of these features are featured in another browser, please let me know (via comments), or it would not be unique. Also, if you find another unique feature in Google Chrome please let me know, too. Unfortunately I’m on a Macbook Pro, so I’ll have to wait for the OSX version. 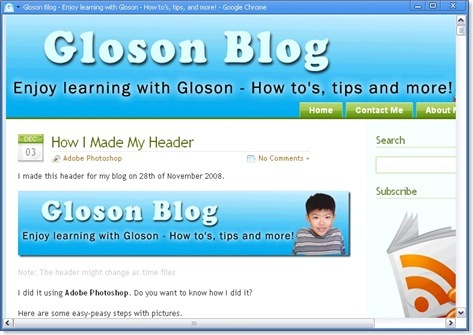 Great blog Gloson, I found you on Twitter. Peace. Thank you very much…feature removed. 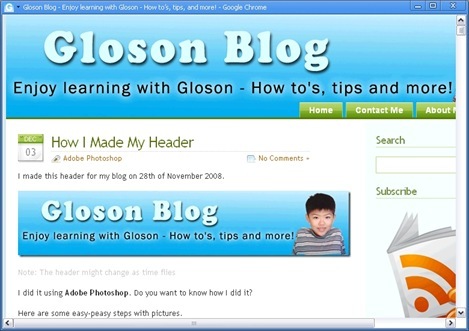 Hi Gloson, your blog is absolutely cool and you write great articles! Keep it up! If you’ve time, try to visit my blog @ http://kidtechguru.blogspot.com …I’m a 14-Year-Old tech blogger. Hey,how did you know so much about computers and stuff?You look like you know everything in or out the computer.Compared to my blog yours is much more better. Wow Gloson! You have convinced me to go over to Chrome without hesitation! Thanks very much for introducing me to this great new way of browsing. I think I know how Google Chrome started faster than other browsers. You see, G.C. has a very minimalistic GUI, right? And also, see the process of G.C.. Well, G.C. is said to be a multi-process browser, just like I.E.. If they do as a single-process browser(like Firefox), that’s what made it a little bit slow because it has to initialize everything unlike multi-process browser. Gloson that post was a dang! I guess you are having more feature than that filthy chrome.. Superb information.You have convinced me to go over to Chrome without hesitation! Thanks very much for introducing me to this great new way of browsing. Your every post is great.